Only electricity and air, will be able to create food, which sounds incredible is it? 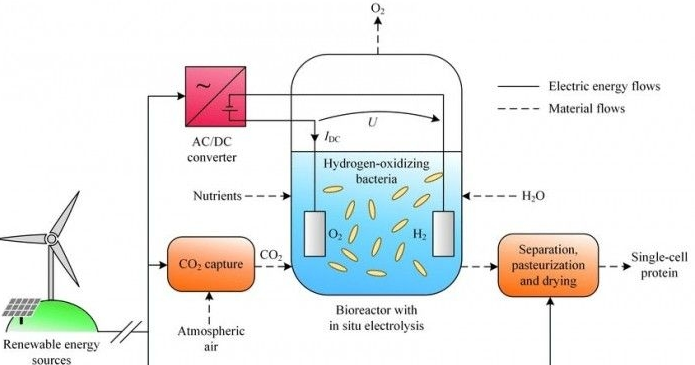 just now,The Finnish National Center for Technical Studies, together with the La Pang Lanta Polytechnic University, presented the results of an electrical connection into a bioreactor equipped with water and microbes. After the work began, the water was electrolyzed to hydrogen and oxygen, Inject carbon dioxide. At this time the magical thing happened, because in the provision of nitrogen, sulfur, phosphorus and other micronutrients, the reactor microbial growth, synthetic protein. And when the water off, you get the protein powder, the protein content of more than 50%, 25% carbohydrate, the rest of the fat and nucleic acid. The current production of such a gram of protein takes about two weeks,The equipment required to produce 1 gram of protein is about the size of the coffee cup, but scientists are improving the efficiency of the device, and ultimately the efficiency of at least 10 times higher than photosynthesis.